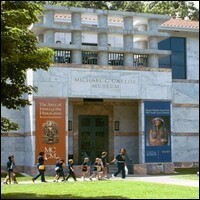 Michael C. Carlos Museum of Emory University collects, preserves, exhibits and interprets art and artifacts from antiquity to the present in order to provide unique opportunities for education and enrichment in the community. In addition to holding one of the most comprehensive art collections in the region, the museum is also recognized for presenting one of the most international and distinguished exhibition calendars of any university museum. Parking: Visitor parking is available in the Boisfeuillet Jones Visitor Lot off Dowman Drive, the main entrance road to campus, or in the Fishburne Parking Deck off Fishburne Road. The Museum is a short walk from either parking location. After 6 p.m. and on weekends free parking is available in any space on campus not reserved by an orange park or a handicapped sign. All visitors to the Emory University campus pay for parking before 6 p.m. Monday through Friday.